The spiritual art of sacrifice is about how sacrificial actions manifest new life energy. In 1989 as we were still just discovering the pieces and developing Oracle of the Heart™ my wife and I were invited to accompany a group of Mayan scholars and spiritual teachers on a trip to the Yucatan Peninsula. We were to perform traditional ceremonies in seven Mayan sacred sites. Among these scholars were Hunbatz Men, a “Mayan Elder”, Barbara Hand Clow, author and owner of Bear and Company Publishing and Jose Arguelles, author of “The Mayan Factor” and instigator of the Harmonic Convergence. As Barbara and I were preparing for this amazing trip we learned of Maya’s that were very different from the barbaric blood thirsty ones that most of us learned about in school. We discovered that there were in fact two distinctly different groups of Mayans. The first group were enlightened thinkers, visionaries, architects. Culturally and scientifically they were the most advanced people on earth, then and now. The second group imitated these enlightened ones; but then imitators lacking in soul awareness often misinterpret the intentions of those whom they are imitating, especially when there is a 200 year gap between the first group and their imitators. This is really quite common. When the enlightened leaders are gone their words are often misunderstood by the generations that follow. Truth they say is a two edged sword. So it is not ha rd to imagine that the original Mayans taught, as Jesus did, “to ascend into the heavens you must sacrifice the hardness of your hearts.” Then along came the ‘imitators’ who decided that this means they must cut out the hearts of their enemies and of innocent young women to appease their angry gods and to control the masses. While in Palenque Barbara and I participated in a sunrise peace ceremony at Temple of the Sun. While standing in prayerf ul meditation in front of the Sun Cross Codex that is carved into a massive stone there, we were both taken into very high states of awareness wherein we were given keys which would ultimately enable us to complete our work with Oracle of the Heart™. As it turns out, that codex is all about the spiritual art of sacrificing the hardness of our hearts. This Mayan art is also what Oracle of the Heart™ helps us to do with ease and grace. 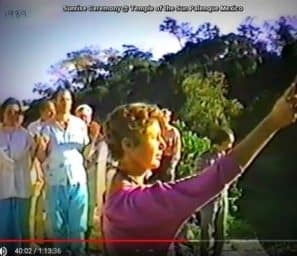 YouTube of that trip: ‘The Great Mayan Initiation’. I will use the first of Oracle of the Hearts 128 Doors of Perception as an example of this sacred art of sacrifice. The Door of Perception is; “I am not receiving”. By simply repeating this phrase “I am not receiving” you may call forth memories of experiences when you were not receiving. What comes to mind for me are experiences of not receiving encouragement and acceptance. I was a poor student in a family where education was believed to be the Holy Grail for success. Poor grades meant criticism, punishment and restriction, and later on it meant crappy jobs and low pay. Working with the ‘Doors of Perception’ meditations harvesting your memories quite often bring up defensive feelings and these defensive feelings are what harden our hearts. In this process we face our memories and affirm the same energy that they came in on. In the case of the first primal imprint, it is “Receiving”. So in my creative imagination I look into the eyes of whoever shows up in that memory. Then I affirm “I am receiving”, with an open heart. Opening my heart allows me to let go of my defensive feelings. Creative loving ones flow in which continue to naturally dissolve the defensive ones. Next we open a channel directly into spirit. Thinking of that same person we say “Thank you”, which opens our human heart. And finally we say “Bless Us” for the Highest Good” opening a channel to heal our old wounds. The result releases us from the clutches of our past. This is how we sacrifice the hardness of our hearts. All that we offer here is to empower you to reclaim valuable life forces still entangled within unresolved past events. This inner awareness technology enables you to ascend to new levels. To truly ‘See Yourself Loving’ opens you to new creativity and fulfillment, living more fully and wholeheartedly in the present. JOIN US as Full Access Members and have all that we have created from Oracle of the Heart and learn to Sacrifice the Hardness of Your Heart with Loving Heart Experiences.